She was born September 11, 1941, in Little Rock and 16 years old when she entered Central High School. Although all of the nine experienced verbal and physical harassment during the 1957-1958 school year at Central, Brown was first suspended, and then expelled for retaliating against daily torment. In February of 1958, she moved to New York and lived with Doctors Kenneth B. and Mamie Clark, African-American psychologists. She graduated from New York's New Lincoln School in 1959. Brown attended Southern Illinois University and majored in journalism. Brown is now a social activist and has worked on behalf of peacemaking, environmental issues, developing youth leadership, diversity education and training, cross-cultural communication, and gender and social justice advocacy. She served in the Clinton Administration as Deputy Assistant Secretary for Workforce Diversity at the Department of the Interior from 1999 to 2001. She has taught social work at Carleton University and in various community colleges in Canada. Elizabeth was born on October 4, 1941, and is one of six children. The image of 15-year old Eckford, walking alone through a screaming mob in front of Central High School, propelled the crisis into the nation's living rooms and brought international attention to Little Rock. On September 4, 1957, Elizabeth Eckford arrived at Central High School alone. She got off the bus a block from the school and tried to enter the campus, but was turned away by Arkansas National Guard troops. She then confronted an angry mob of people opposing integration, chanting, "Two, four, six, eight, we ain't gonna integrate." As she made her way down the block, Eckford attempted two more times to enter the school campus, but was blocked by the guardsmen, who were there under orders from the governor to keep them out. Eckford made her way through the mob and sat on a bus bench at the end of the block. She was eventually able to board a city bus, and went to her mother's job at the Arkansas School for the Deaf. Because all of the city's high schools were closed the following year, Eckford did not graduate from Central High School. She joined the U.S. Army, and was able to earn her G.E.D. and returned to Little Rock in the 1960s to be closer to her parents. She attended Central State University in Wilberforce, Ohio. Eckford is an Army veteran, and has held various jobs throughout her life. She has been a waitress, history teacher, welfare worker, unemployment and employment interviewer, and a military reporter. Ernest was born in Little Rock, Arkansas, on September 22, 1941. Green made history as the only senior among the "Little Rock Nine." His place in Arkansas' civil rights history was solidified when he became the first African-American to graduate from the previously all-white high school in May of 1958. An active member of the community from an early age, Green regularly attended church. He was involved in the Boy Scouts and eventually became an Eagle Scout. He was a student at Horace Mann High School before volunteering to integrate all-white Central High School. Green persevered through a year of daily harassment by some of his fellow students to become the first African-American Central High graduate on May 25, 1958. Sitting with Green's family at the event was the Rev. Dr. Martin Luther King, Jr., who attended the graduation virtually unnoticed. After graduating from high school, Green attended Michigan State University, earning a bachelor's degree in 1962 and a master's degree in 1964 in sociology. Afterwards, he served as the director for the A. Phillip Randolph Education Fund from 1968 to 1977. He then was appointed as the assistant Secretary of Housing and Urban Affairs during President Jimmy Carter's administration from 1977 to 1981. Currently, Green is Managing Director at Lehman Brothers in Washington, D.C. and has been with the company since 1987. He has served on numerous boards, such as the National Association for the Advancement of Colored People (NAACP) and the Winthrop Rockefeller Foundation. Thelma was born in 1940 in Bloomberg, Texas. Wair attended Dunbar Junior High School and Horace Mann High School before transferring to Central. Despite daily torment from white students at Central, she completed her junior year at the formerly all-white high school during the tumultuous 1957-58 year. Because the city's high schools were closed the following year, Wair earned the necessary credits for graduation through correspondence courses and by attending summer school in St. Louis, Missouri. She received her diploma from Central High School by mail. Thelma Mothershed Wair graduated from Southern Illinois University, Carbondale, in 1964 and earned her master's degree in Guidance and Counseling, as well as an Administrative Certificate in Education from Southern Illinois University, Edwardsville. Wair taught home economics in the East St. Louis school system for 28 years before retiring in 1994. Wair has also worked at the St. Clair County Jail, Juvenile Detention Center in St. Clair County, Illinois, and was an instructor of survival skills for women at the American Red Cross Shelter for the homeless. During the 1989-1990 school year, she was honored as an Outstanding Role Model by the East St. Louis chapter of the Top Ladies of Distinction and the Early Childhood-Pre-Kindergarten staff of District 189. Melba was born on December 7, 1941, in Little Rock, Arkansas. She later recounted her experience at Central High School in her book Warriors Don't Cry: A Searing Memoir of the Battle To Desegregate Little Rock's Central High School. Beals grew up surrounded by family members who knew the importance of an education. Her mother, Lois, had been one of the first African-Americans to graduate from the University of Arkansas in 1954. At Central, Beals faced daily harassment from white students and as Beals later recounted, the soldier assigned to protect her instructed, "In order to get through this year, you will have to become a soldier. Never let your enemy know what you are feeling." Beals took the soldier's advice, and finished the school year. Barred from entering Central High School the following year when the city's schools were closed, Beals moved to Santa Rosa, California, for her senior year of high school. Beals graduated from San Francisco State University with a bachelor's degree. She earned a graduate degree in communications from Columbia University, worked as a reporter for NBC, and has served as a communications consultant. 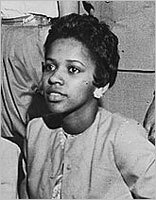 Beals is also the only one of the Little Rock Nine to have written a book based on her experiences at Central High School. The book, published in 1995, is a first-hand account of the trials and tribulations that Beals and the nine students encountered from segregationists and racist students. The oldest of three daughters, was born on December 18, 1942, in Little Rock, Arkansas. 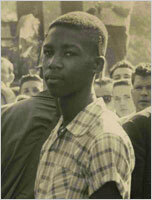 LaNier made history as the youngest member of the Little Rock Nine. Inspired by Rosa Parks, she had a desire to get the best education available by enrolling in Central High School. White students called her names and spat on her while armed guards escorted her to classes, but LaNier concentrated on her studies and protected herself throughout the school year. 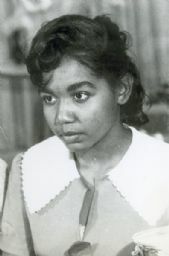 LaNier, along with all other Little Rock high school students, was barred from attending Central the next year when the Little Rock high schools were closed, but she returned to Central High and graduated in 1960. LaNier attended Michigan State University for two years before moving with her family to Denver. In 1968, she earned a Bachelor of Science from Colorado State College (now the University of Northern Colorado) and began working at the YWCA as a program administrator for teenagers. In 1977, she founded LaNier and Company, a real estate brokerage firm. Her experience in real estate includes everything from constructing and remodeling properties to marketing and selling them. LaNier is currently the president of the Little Rock Nine Foundation, a scholarship organization dedicated to ensuring equal access to education for African-Americans. Terrence was born December 3, 1941, in Little Rock, Arkansas. Roberts was a sophomore at Horace Mann High School when he volunteered to integrate Little Rock's Central High School. When the city's high schools were closed to prevent further desegregation, Roberts moved to Los Angeles, California, and graduated from Los Angeles High School in 1959. Following his graduation from high school, Roberts attended California State University and was awarded a bachelor's degree in sociology in 1967. He went on to attend graduate school at the University of California at Los Angeles and received a master's degree in social welfare in 1970. In 1976, Roberts was awarded a Ph.D. from Southern Illinois University in psychology. Following his graduation from SIU, Roberts moved to the Napa Valley and directed the mental health unit of St. Helena Hospital in Deer Park, California, for ten years. After this, Roberts accepted an invitation to join the UCLA School of Social Welfare as assistant dean. In 1994, he took a position of department chair of the psychology program at Antioch University, Los Angeles. As demands on his time increased, Roberts became program co-chair to concentrate on the activities of his management consulting firm. Currently, he is a faculty member at Antioch and travels widely sought-after speaker and consultant. Jefferson was born in 1942 in Little Rock, Arkansas. A quiet young man with a sense of humor, Thomas was a track athlete at Horace Mann High School when he chose to volunteer to integrate all-white Central High School for the 1957-58 school year as a sophomore. The Nine were harassed daily by white students, and Thomas' quiet demeanor made him a target for bullies at the school. He graduated from Central high School in 1960 and eventually became an accountant for the United States Department of Defense. Thomas is now retired. Gloria was born September 26, 1942, in Little Rock. She was the third child of H.C. Ray, Sr. and Julia Miller Ray. Mr. Ray was already a retired federal employee when Gloria entered Central High (he was born 1889, the son of a former slave). In the beginning of the century, it was he who founded the Arkansas Agricultural Extension Service for Negroes under the auspices of the US Dept of Agriculture; he had also studied and work for none other than the distinguished George Washington Carver and Booker T. Washington, before graduating from Tuskegee Institute. These facts strongly influenced Ray's choice to attend Central High School. She was 14 years old when she finished Dunbar Junior High School and registered to attend Central for her sophmore year. Ray, like the others of the Nine, was tormented by certain whitestudents who called her names, threw things, spit, vandalized her locker, and even pushed her down a flight of stairs. Still, like the others, she was determined to finish the year. Her mother, a woman with two university degrees, and a Sociologist working for the State of Arkansas, was fired by Faubus when she refused to withdraw Ray from Central High. 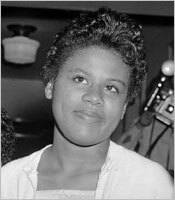 The following year when all public high schools in Little Rock remained closed, Ray moved to Missouri where her mother had been able to find employment, and attended the newly integrated Kansas City Central High School. After high school graduation, she attended Illinois Institute of Technology (ITT), in Chicago. She graduated in 1965 with a bachelor's degree in Chemistry and Mathematics. Immediately after graduation she worked briefly as public school teacher and laboratory research assistant at the University of Chicago Research Medical Center.